In the 1840 election William Henry Harrison’s Whig party supporters got some extra help from a Democratic newspaper. The paper claimed that if he got his pension and a barrel of cider, Harrison would retire to a log cabin in Ohio. As a result people thought of Harrison as a common man, despite the fact that he was the son of a wealthy Virginian who signed the Declaration of Independence. Supporters nicknamed Harrison “Tippecanoe” after a battle he had fought against a confederation of Native Americans. “Tippecanoe and Tyler, too” made a catchy campaign slogan. The election also gave birth to the American expression “O.K.” Democrats used O.K. as affectionate shorthand for Harrison’s opponent, Martin Van Buren, who was known as “Old Kinderhook” after the town in New York where he grew up. 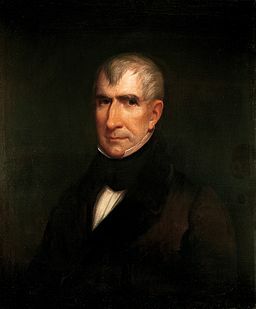 Harrison was the first Whig party candidate to win a presidential election. The Whig party had formed out of opposition to President Jackson’s policies. Whigs wanted a strong federal government and social reforms. Harrison was mainly nominated and elected because he had few political enemies and didn’t share his personal opinions. No one knows what kind of president he would have been because he died from pneumonia one month after his inauguration. He was the first president, though not the last, to die in office. Shortly after taking the oath of office, Tyler’s wife died, which made him the first president to become a widower in office. Tyler soon married Julia Gardiner, a young woman thirty years younger than he. In many ways, Tyler seemed like a natural fit for the presidency. At fifty-one he already had political experience serving as a governor and a congressman. His tall, thin frame made him stand out in a crowd, and he had an excellent speaking voice. Tyler was a former Democrat who had switched over to the Whig party during Jackson’s presidency. Yet he still felt strongly about states’ rights. This feeling got him into trouble with his party, which favored a strong federal government. He vetoed bills that Whigs in Congress and in his cabinet wanted. 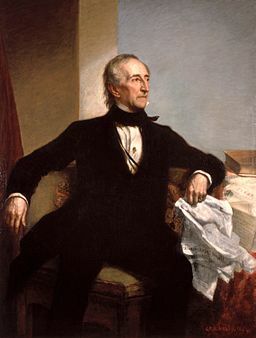 After vetoing a tariff bill introduced by Whigs, the first ever impeachment resolution of a president was made against Tyler. The resolution failed. Nevertheless, Tyler remained a mainly ineffectual executive.